Sunday was an ice cream lover’s dream come true. 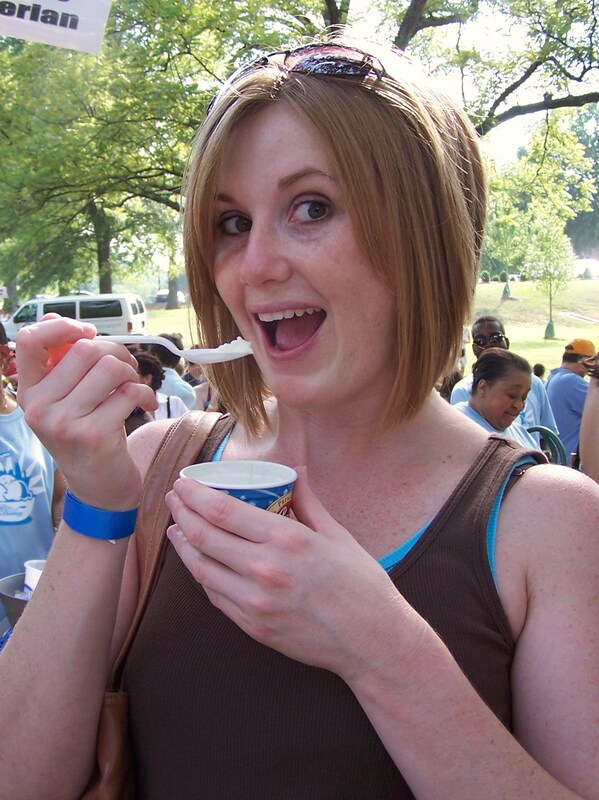 The Martha O’Bryan Center held its 23rd Purity Miss Martha’s Ice Cream Crankin’ Contest on the lawn of First Presbyterian Church in Nashville. Basically, it’s all the homemade ice cream you can eat, dozens of unique flavors, all for $8. After church, lunch, and a little naptime, you had better believe the Rutabagas were there for this one. All you can eat homemade ice cream. Who doesn’t love that? We even managed to drag the husband along. 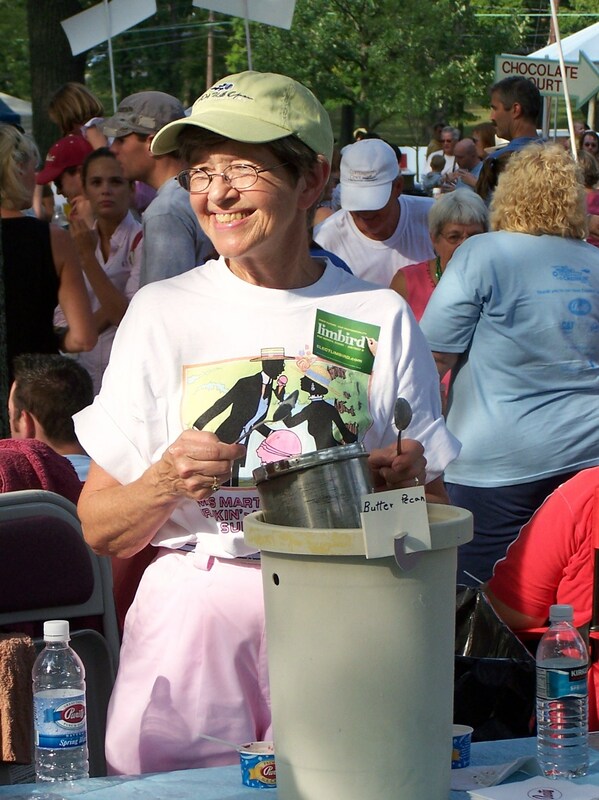 Since 1984, Miss Martha’s Ice Cream Crankin’ contest has brought together people from many communities across Nashville to crank homemade ice cream and serve it up for a great cause. 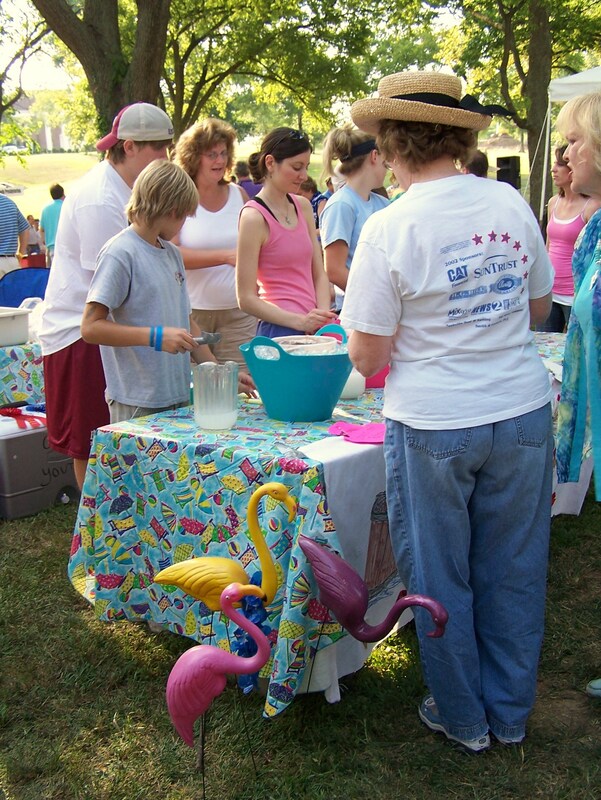 The contest, sponsored by Purity dairies, benefits the Martha O’Bryan Center, a non-profit organization providing integrated services to families in the James A. Cayce Homes, Nashville’s oldest and largest public housing development, as well as residents of surrounding East Nashville neighborhoods. Judging by the size of the crowd, and the large amount of paper sampling cups dispensed, I’d say that this year’s event was a success. The Martha O’Bryan Center’s mission statement is as follows: “On a foundation of Christian faith, the Martha O’Bryan Center empowers children, youth, and adults in poverty to transform their lives through work, education, employment, and fellowship.” The ministry that is now known as Martha O’Bryan Center began in 1894, when Miss Martha O’Bryan organized The Gleaners Society at First Presbyterian Church, Nashville to assist her in delivering food, clothing, and furniture to families in need. During the next 50 years, the ministry met the needs of the community in a variety of ways including establishing Nashville’s first kindergarten, a girls’ settlement home, and a free clinic. As I said before, Miss Martha’s Ice Cream Crankin’ is an ice cream lover’s dream. Even if you’re not feeling charitable, this event is a can’t miss. As one exuberant Rutabaga exclaimed, “This is better than Christmas!” (The presents part, not the Jesus’ birthday part, of course.) The weather was perfect, a nice breeze was blowing, and the tall trees that scattered the ample lawn in front of the First Presbyterian Church provided plenty of shade. 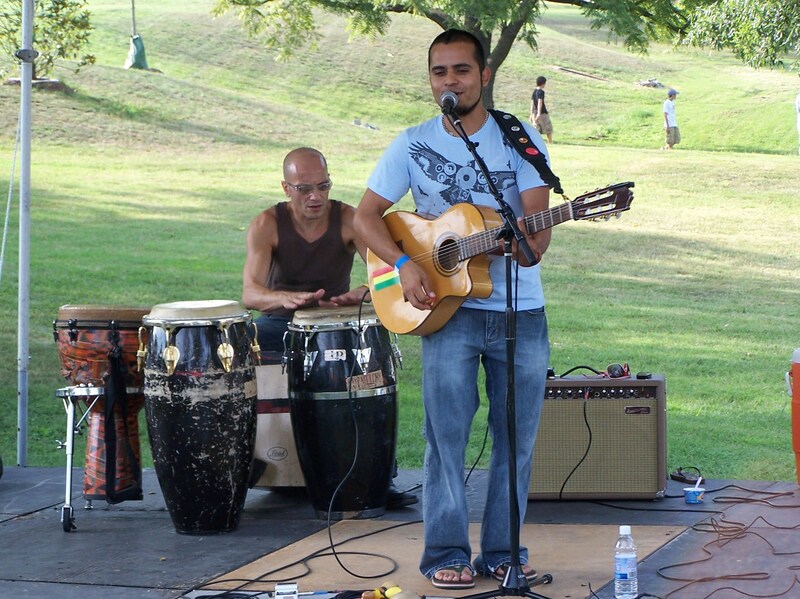 There were four entertainment stages spread across the grounds to provide a little ambience. 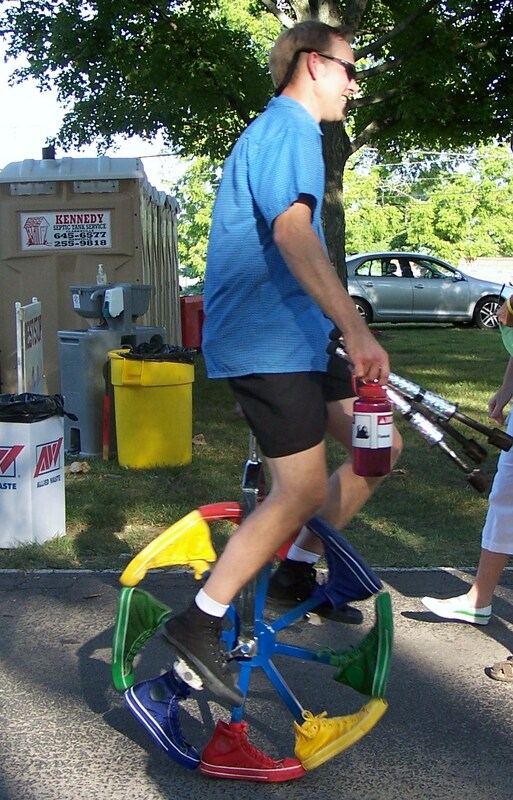 If that wasn’t enough, a random guy popped up here and there riding about six different types of unicycles and even managing to throw in some fire baton juggling. Here’s the breakdown. After we parked our cars at the nearby John Overton High School and crossed Franklin Pike with the help of a lovely law officer/temporary crossing guard, we made our way over to the ticket table and paid our $8. 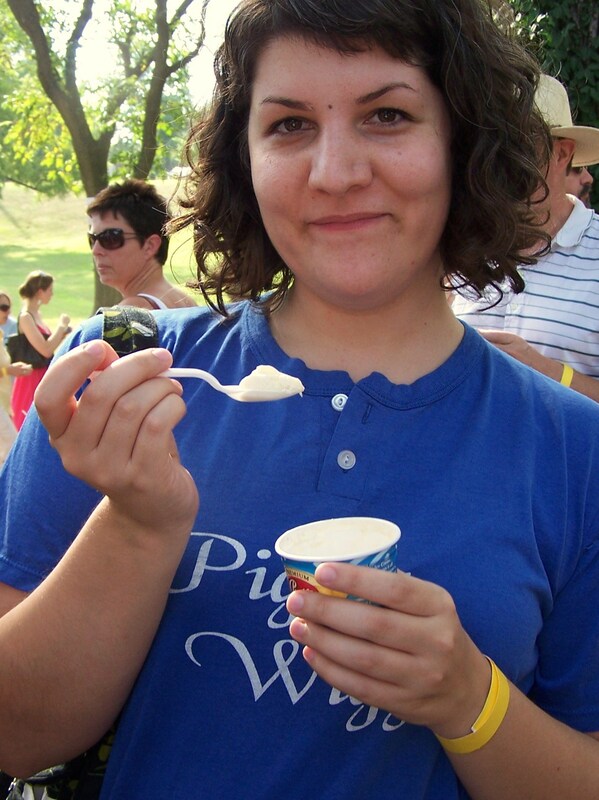 This year, people who bought tickets online also received a coupon for a free pint of Purity ice cream. We did not do this and hope they provide this little online ticket incentive next year. 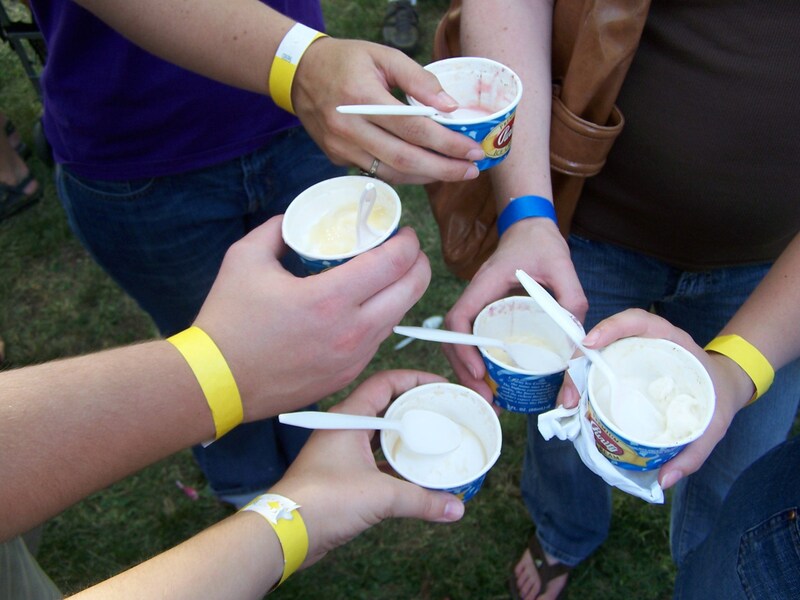 After getting all paid up, we were each given a paper bracelet, the kind you sometimes get at bars or fairs or amusement parks, a little blue paper cup, and a plastic spoon. Cups and spoons in hand, we were let loose to navigate the crowded tents and tables housing all sorts of coolers, cranks, and iced Tupperware containers. We were on a mission to try every flavor we could. 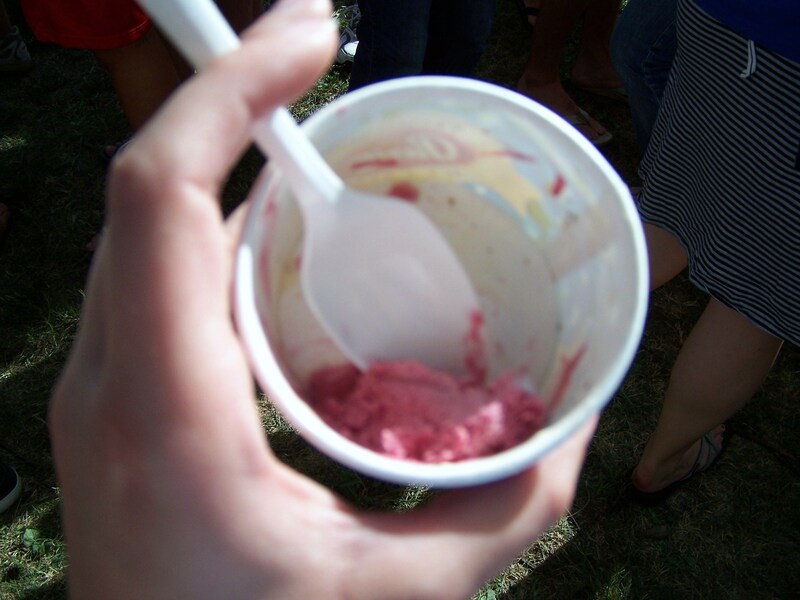 There were chocolate based, vanilla based and sorbets, fruity flavors and alcohol mixes. The choices ranged from simply vanilla to “whoa, there is way too much going on in this cup.” The sampling sizes ranged from one tiny spoonful to a whole cupful of ice cream, depending on the server. We made valiant efforts to sample every single flavor, but with over 500 gallons of ice cream available in who knows how many flavors, there was no way that was going to happen. No possible way. But we did have fun trying, and stuffing ourselves until we were almost sick. Here are a few of my favorite scoops: Wild Flower honey (the only table I went back to for seconds), pistachio, lemonade sorbet, tequila Mexican vanilla (because everything’s better when you add tequila to it), and double berry. 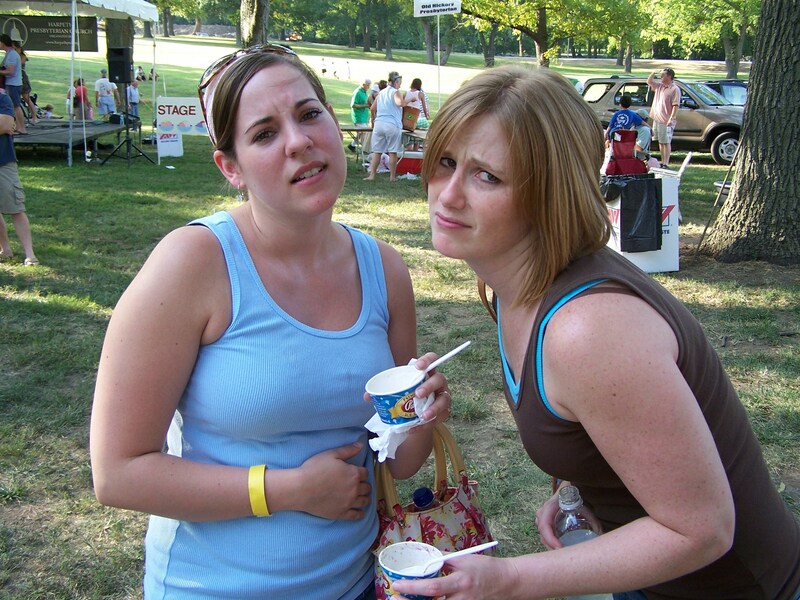 In the midst of all the ice cream sampling madness, there was actually a contest going on. Aside from all us regular folks, there were bona fide ice cream judges, consisting of Purity representatives, ice cream industry specialists, and local celebrities. Awards were given for 1st, 2nd, and 3rd place in the following categories: chocolate base, vanilla base, other, and youth created (Age 16 and under). A winner was chosen from each category, and the overall favorite was named the Miss Martha’s Crankin’ Contest winner. Coco Loco was the winning creation, dreamed up and mixed up by a pair of 13-year-old boys. Coco Loco is made of chocolate ice cream, caramel swirl, and Take 5 candy bars. If all goes as planned, meaning Purity can duplicate the flavor for mass market, we’ll be seeing this new flavor in stores sometime in February. Sadly, I missed out on trying the winning flavor. Since I’m not a huge fan of chocolate ice cream, I skipped the chocolate-base section to make sure there was room in my tummy for everything I wanted to try. Despite this seemingly brilliant plan and my efforts to eat as little as possible all day, there wasn’t. Maybe next year. Speaking of next year, I can’t wait until next summer just so I can do this all over again. It was that good, y’all. I’m sure all the Rutabagas would agree. Must haves: a lot of room in your tummy for a lot of ice cream and maybe a couple bottles of water. If you’re anything like me, all that ice cream will make you thirsty. Luckily, this year, the weather was perfect. But that may not always be the case. Come prepared for hot, August weather if you decide to come out for the Crankin’ contest next summer, which you will because I said to, right? Could have done without it: the reusable cups. 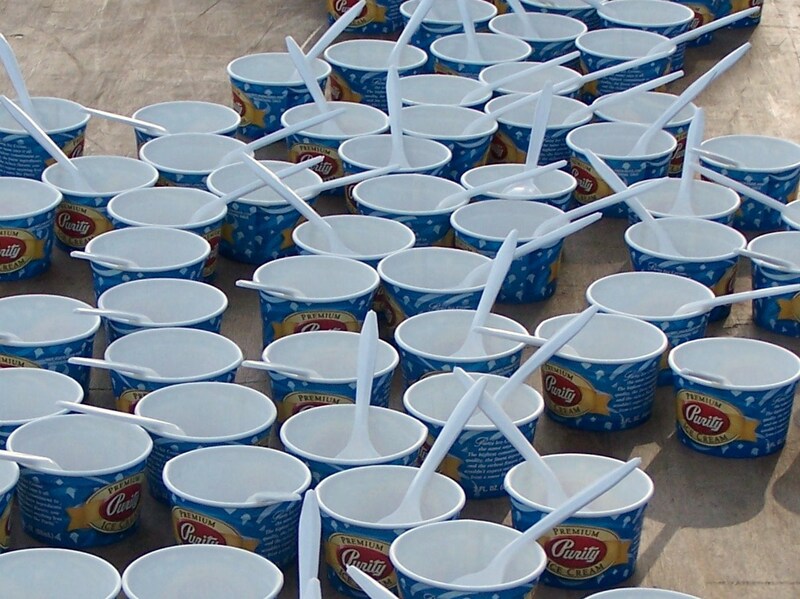 You have to use the same cup and spoon throughout the entire sampling process. They got pretty nasty toward the end. I kept rinsing mine out with bottled water. 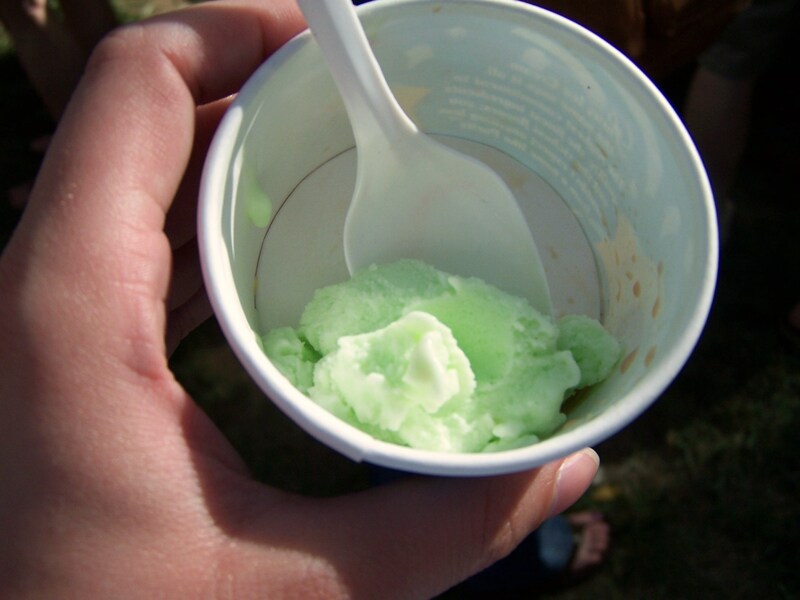 What makes it special: There are all kinds of homemade ice cream flavors, mixtures you would never think of yourself. 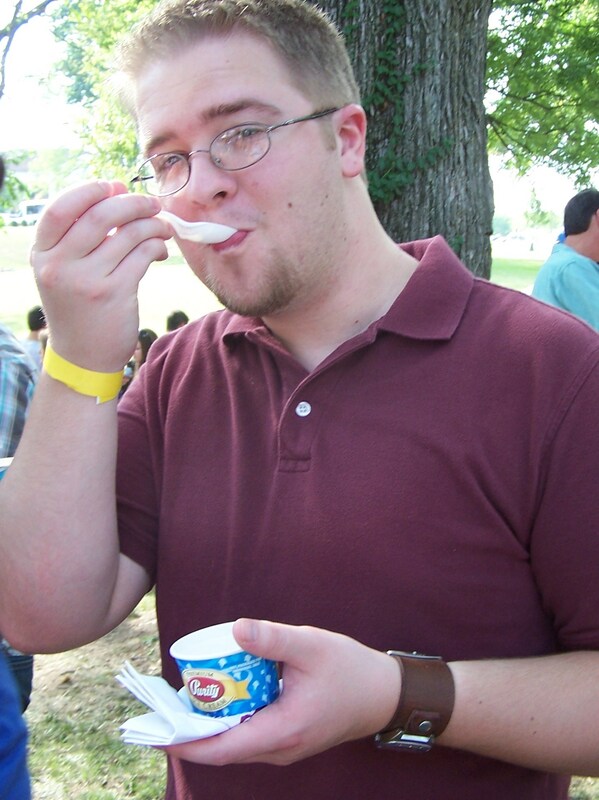 This is more than your churches summer ice cream social with the vanilla and chocolate and occasional peach, strawberry, or banana. When it comes to ice cream, Miss Martha’s Crankers don’t play. Know before you go: You’re pretty much going to be walking around the whole time, so don’t worry about bringing lawn chairs or blankets to sit on. Also, the restrooms are the portable variety, and if you’re like me, you try to avoid those as much as possible. Parking: For this year, the parking instructions were the following (though this may change before next year): You may park at the following locations adjacent to the Crankin’ along Franklin Road the day of the event. Trolleys will pick you up and return you to where you parked coming to and from the Crankin’. Franklin Road Academy, John Overton High School, Holy Trinity Greek Orthodox Church, Due to major construction, there will be no parking on-site at First Presbyterian Church the day of the Crankin’ or at Judson Baptist Church. I would expect that last one to change before next year. Entry filed under: $1-10, Bring the Kids, Charitable Causes, Dessert, Diversions, Ice Cream, Music, Nashville. Tags: Coco Loco, East Nashville, homemade ice cream, Martha O'Bryan Center, Miss Martha's Ice Cream Crankin', Purity ice cream, unicycle, Wild Flower honey. 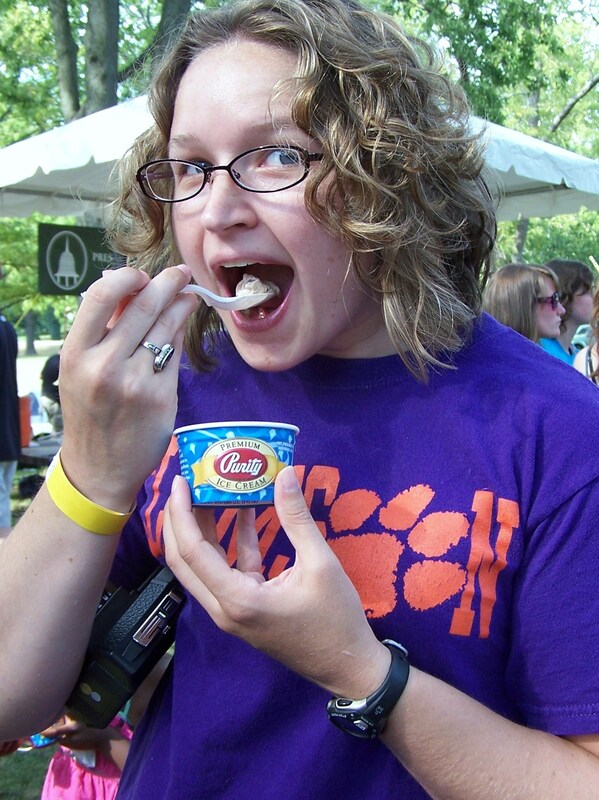 What a great recap of Miss Martha’s Ice Cream Crankin’! Thought you’d be interested in a little more color around the winning flavor, Coco Loco. My 13 year old son and his friend created it. They won the Teen contest and Best of Show. As you say in your post , Purity will introduce Coco Loco next year if they can duplicate the flavor for mass market. I’m extremely proud of these two young men. They spent hours creating the concept, finalizing the recipe, hand cranking the ice cream, developing the name and filling out the contest forms. Quite remarkable considering they’re 13 year old boys! Sue – I bet you are proud of those boys. That’s a lot of hard work for a pair of teenagers. I know they must be thrilled (if teenage boys are ever thrilled) at the possibility of seeing something they created sold in stores. 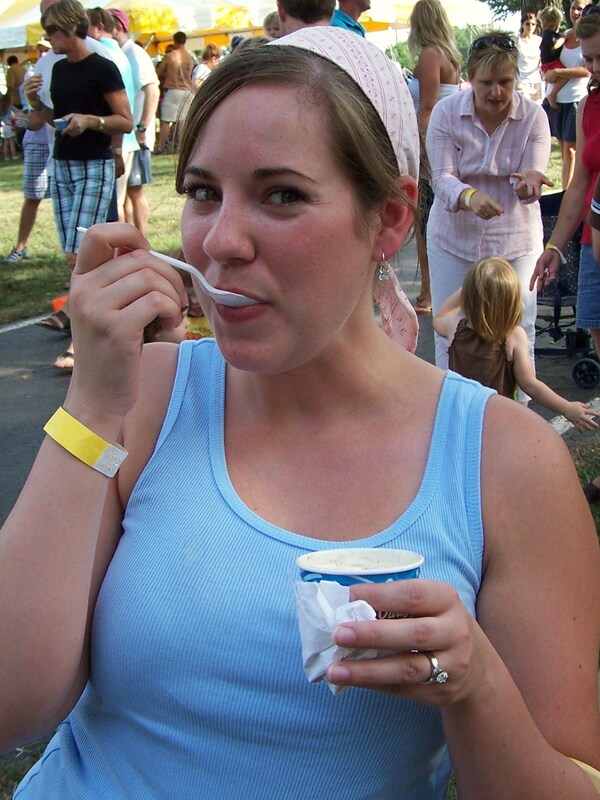 My favorites were the lemonade yogurt (super tangy, which was very refreshing after all the sweetness), one variation of blackberry (and man, that guy KNEW it was good – he was stingy with the servings!) and the lemongrass that was right at the entrance. I’m not usually even a fan of lemon! I also loved the tequila mexican vanilla, but I wouldn’t have put it in my top 5. I missed the wild flower honey, which I’m pretty bummed about – I heard lots of good things! Seriously, this is my new favorite thing about Nashville. Morgan – Yes, there was a blackberry that I remember liking a lot. I tried more than one blackberry. There were soooo many of them that I didn’t even get a chance to try, and others whole names I couldn’t remember after it was all said and done. The whole thing was a crazy whirlwind. It was hard to keep track of what you were eating, what you had sampled, and what flavors you still hadn’t tried. The Wild Flower honey was so very good, very simple too. And yes, this is most definitely at the top of my things to love about Nashville list. Thanks for stopping by the blog. I love Nashvillest. Y’all have all the great tips.